Police have stepped up their search for an 18-year-old college student who went missing after a night out with friends. Troy McMullan, from West Leigh, Havant, was last seen with a blonde girl in Jongleurs nightclub at Gun Wharf Quays, Portsmouth, on Friday night. On Tuesday, the police marine unit was brought in to check boats moored along the waterfront. His family described his disappearance as "out of character", but said he tends to fall asleep when he is drunk. Mr McMullen was last seen talking and dancing with a blonde girl under the stairs in Jongleurs at 0130 GMT on Saturday. He is a student at Havant College, but did not turn up for class on Monday morning. Officers are conducting house-to-house inquiries around Gun Wharf and are distributing flyers and posters with Mr McMullen's picture and description on. 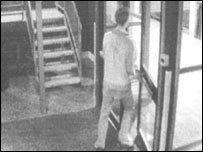 They are also looking at CCTV footage and are keen to trace the girl Mr McMullen was seen talking to in the nightclub. When he disappeared he was wearing jeans and a red jacket with white stripes down the arms. He is blonde, 5ft 10in, of slim build and has blue eyes.